From the North to the South, here's a recap of Theresa May's week! 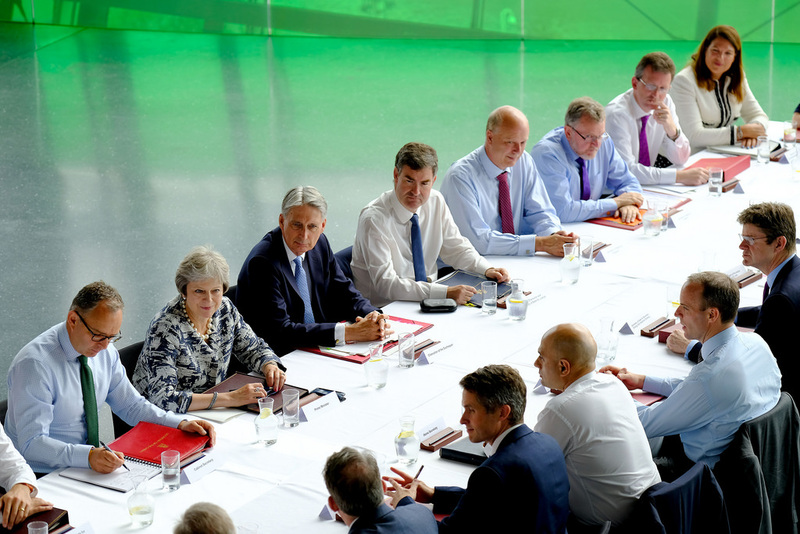 On Monday, the PM and her Cabinet were in Gateshead for a regional Cabinet meeting. 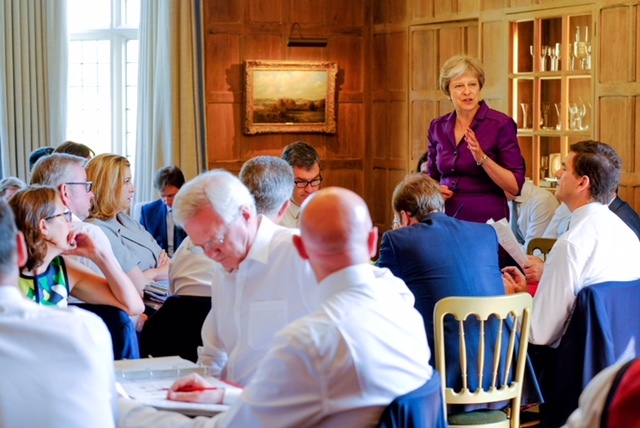 Following the meeting, Theresa May visited the Reece Group and took part in a town hall style Q&A. 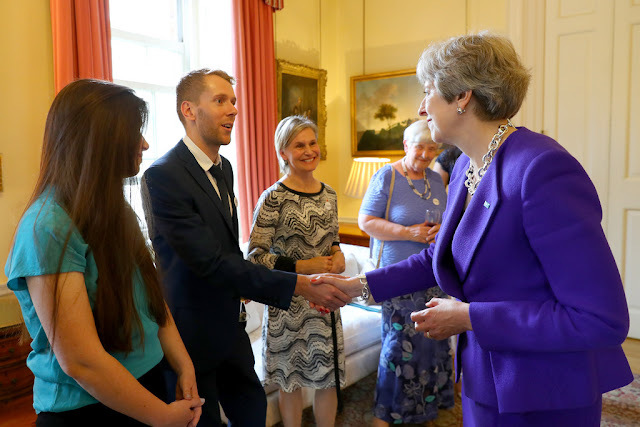 May wore her white and blue Peserico summer jacket, navy trousers and the navy Cocktail slippers from Russell & Bromley. 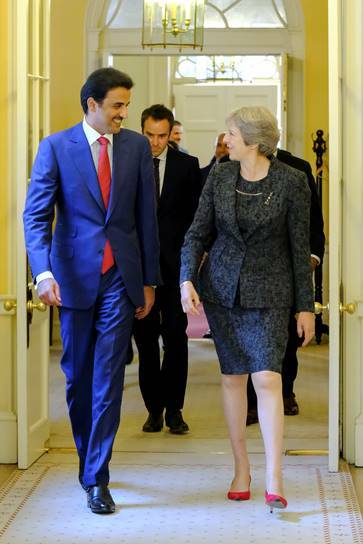 On Tuesday, May welcomed the Emir of Qatar to Number 10. 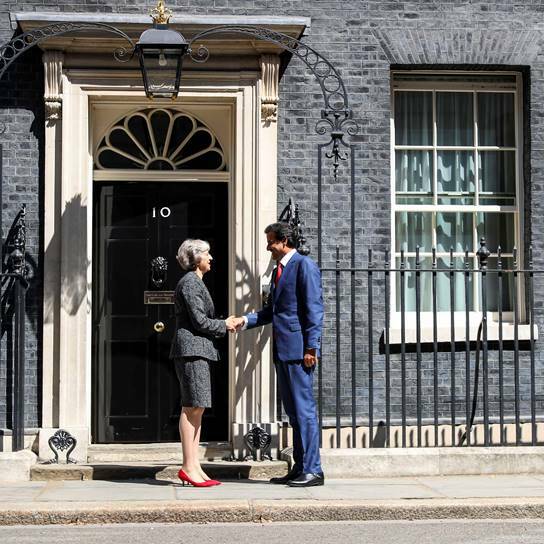 Looking stylish in her grey fleck Escada shift dress and matching jacket, the PM added a pop of colour with the red suede LK Bennett kitten heels. Later in the day, she welcomed the team of divers who helped to rescue the Thai boys trapped in a cave. 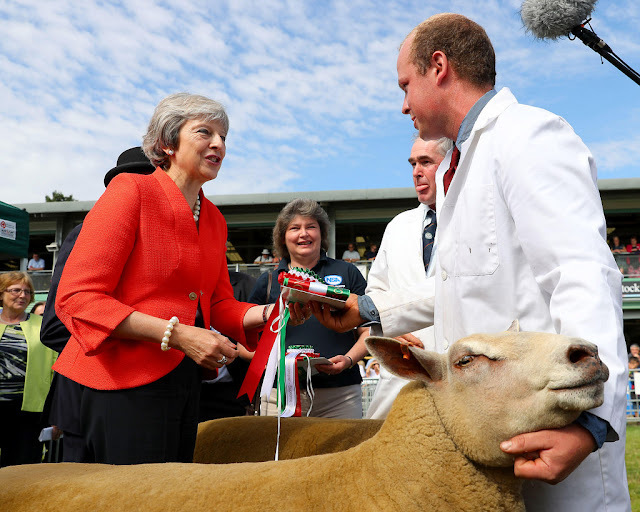 On Thursday the PM was back in Wales to visit the Royal Welsh Show. 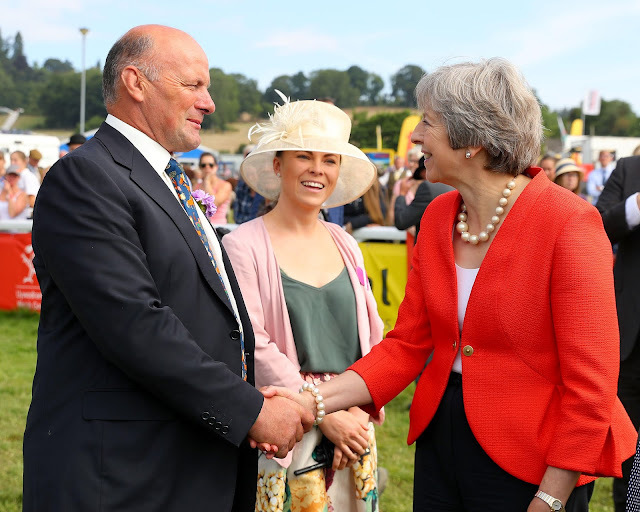 May awarded prizes in the show ring and met with agriculture and business leaders. Our favourite poppin' orange jacket from Daniel Blake was May's sartorial choice, and she paired with black trousers and the navy Russell & Bromley Cocktail slippers. On Friday, the PM was in Salzburg, Austria meeting Chancellor Kurz before attending the Salzburg Festival in the evening. 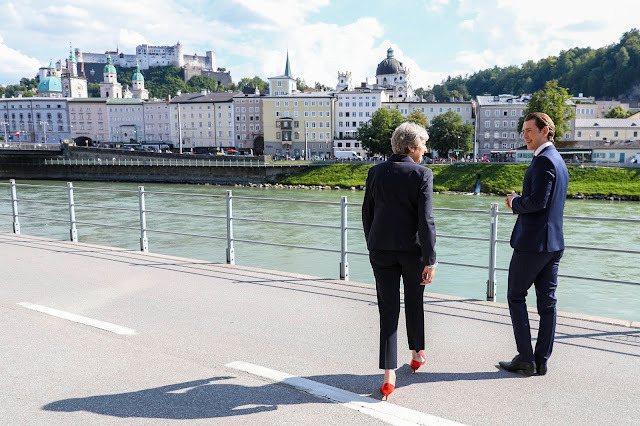 May wore a navy Herno blazer and trousers, accessorising with the oversized silver chain set from Amanda Wakeley and her trusty red patent kitten heels from LK Bennett. For the Festival, May wore her bottle green sleeves evening gown with black embroidery detailing, teaming it with Swarovski accessories and the black Twiggy kitten heels from Russell & Bromley. 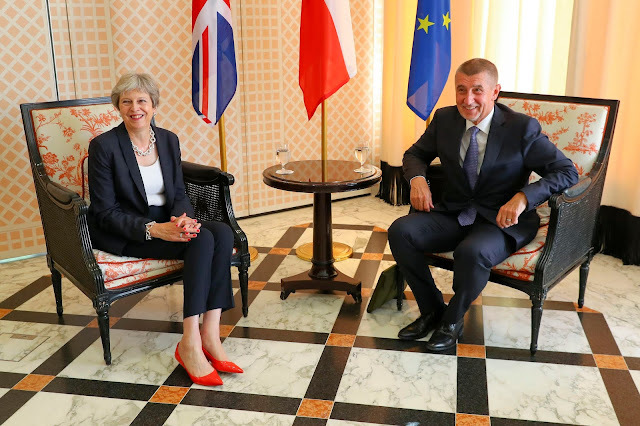 From end of term in Westminster to a two day visit to Northern Ireland, here's a recap of Theresa May's week. On Monday, (after watching the Men's final at Wimbledon!) 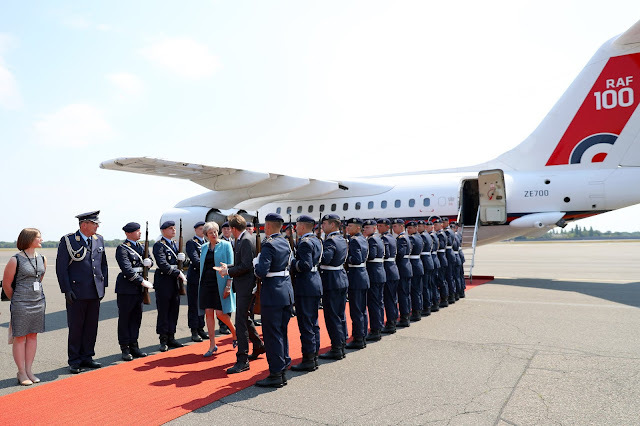 the PM travelled to the Farnborough Air Show. 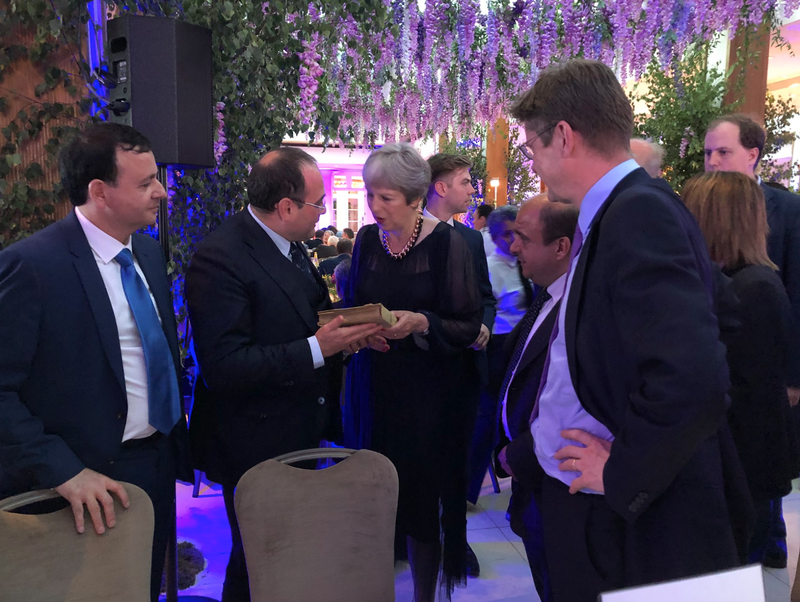 May delivered a speech and met with industry representatives and exhibitors. The PM wore a black and white patterned jacket from Amanda Wakeley and cropped black trousers. 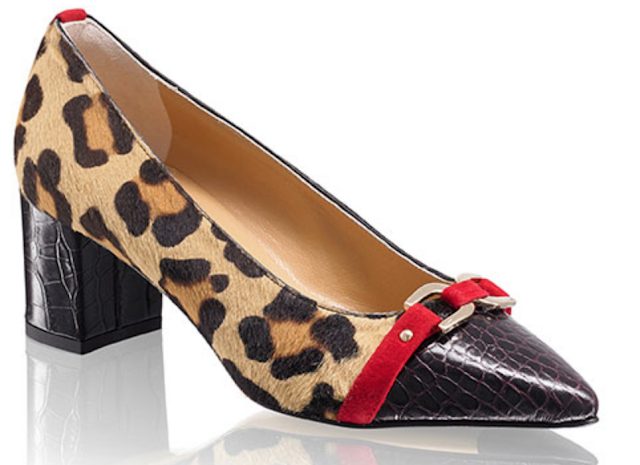 She teamed it with the leopard Delicious flats from Russell & Bromley. On Wednesday, the PM took part in the last Prime Minister's Questions before the summer recess. 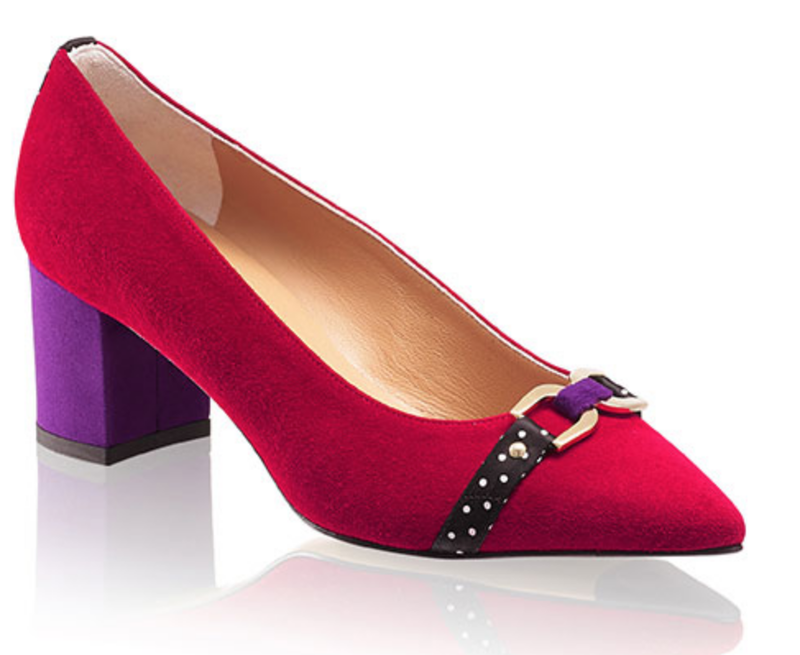 May wore her purple Daniel Blake Orchid suit, keeping it simple in a pair of red suede flats. Later in the day she appeared in front of the House Liaison Committee. On Thursday, the Prime Minister travelled to Northern Ireland for a two day visit. 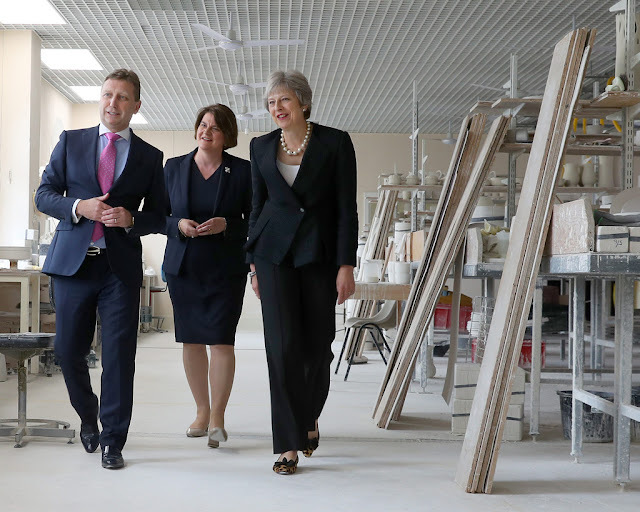 She visited the Belleek pottery factory and met with business leaders. It was a simple, chic outfit for her first day in Belfast- the black Daniel Blake Orchid jacket, black trousers and the leopard Delicious flats. 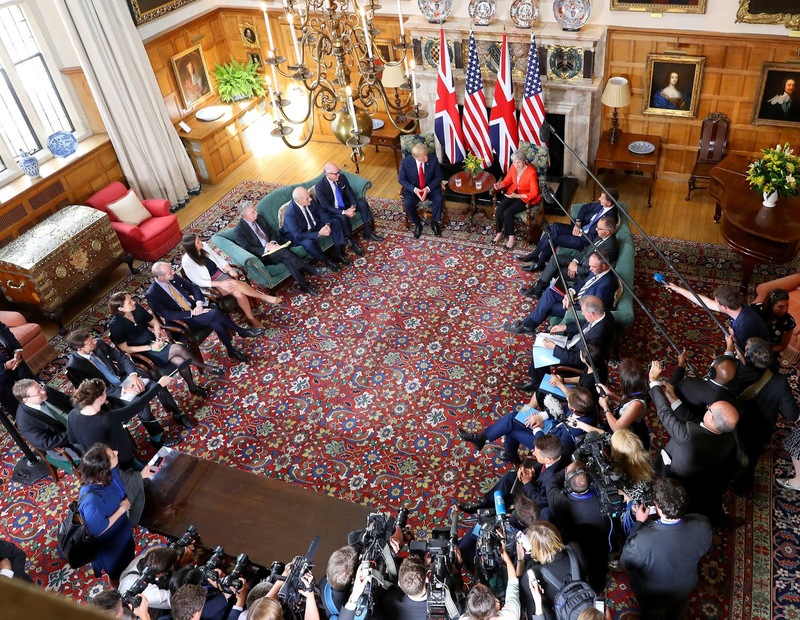 On Friday, May delivered a speech in Belfast. She wore the olive and black striped blazer from Piazza Sempione, olive cropped flared trousers and the leopard Charlotte Olympia kitten heels. 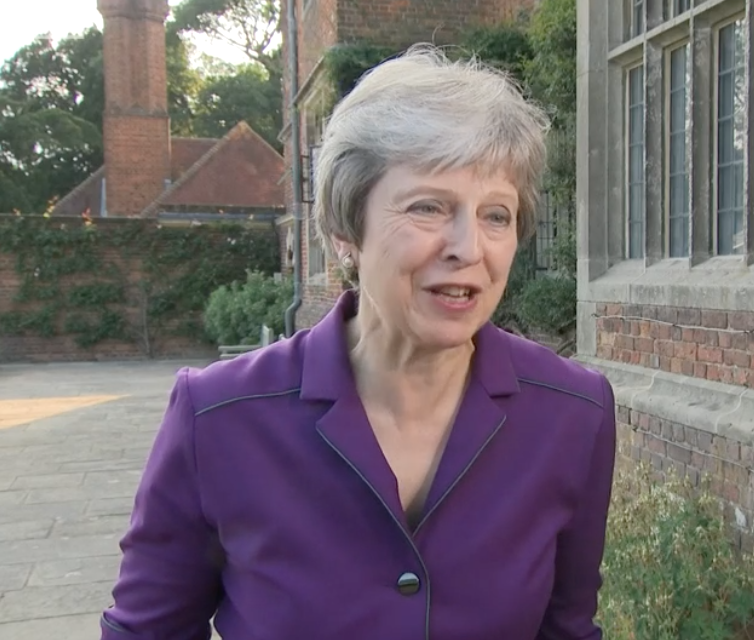 On Monday, Theresa May was in Westminster, updating the House on her Chequers agreement and Brexit. May wore the navy spot Daniel Blake jacket with navy trousers and the Audrey red suede kitten heels from LK Bennett. She accessorised with a string of pearls. 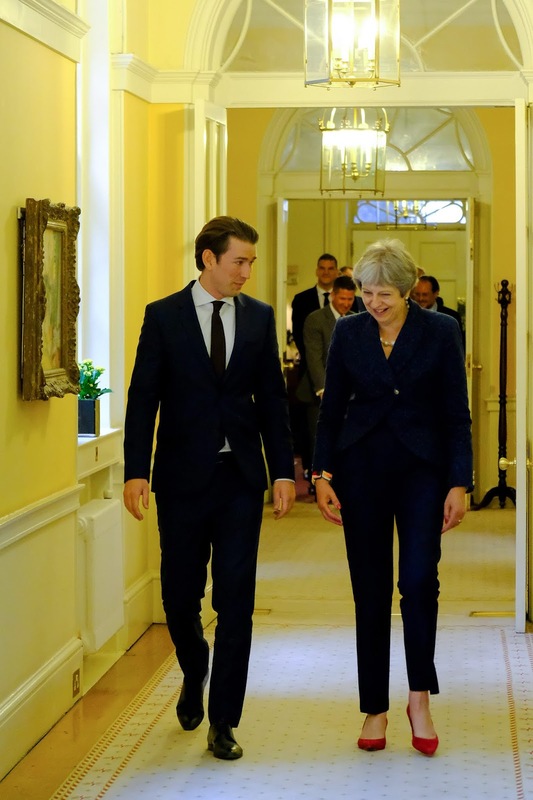 In the afternoon she welcomed the Chancellor of Austria to Number 10. On Tuesday, May attended a service marking 100 years of the RAF at Westminster Abbey. In a subtle nod to their uniforms, the Prime Minister wore a navy shift from Amanda Wakeley, teaming it with a sharp white blazer from Peserico. 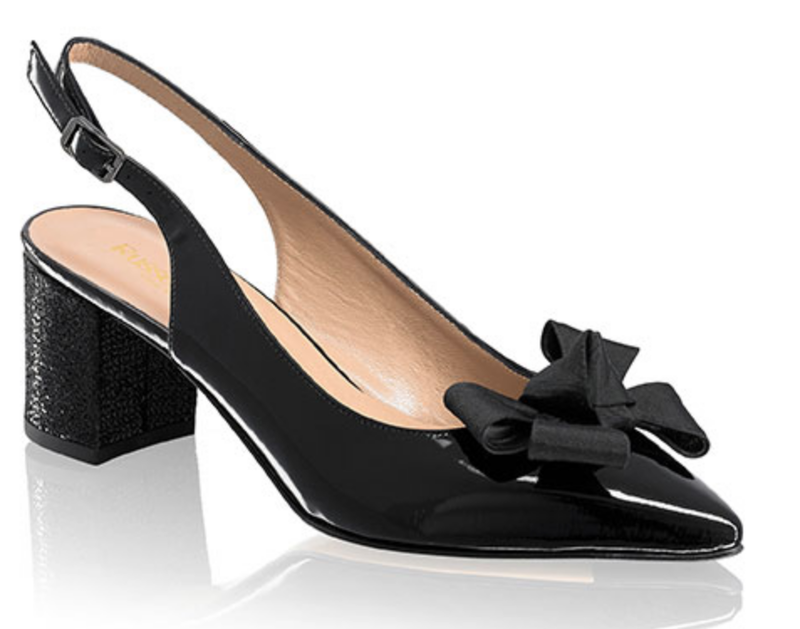 She accessorised with an outstanding navy and white hat from Liz Felix Millinery, based in Henley on Thames, and the navy Twiggy kitten heels. 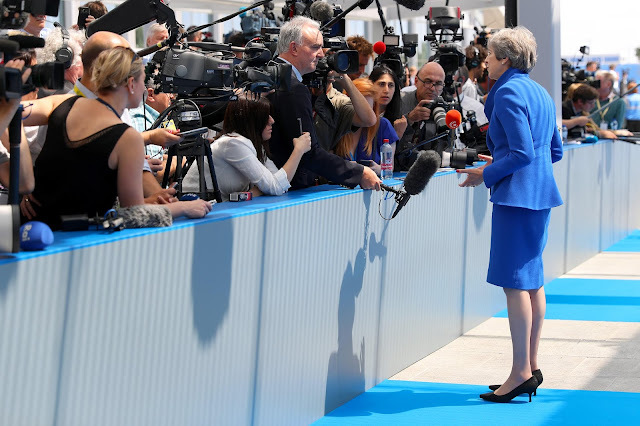 Later in the day, May attended the Western Balkans Summit. On Wednesday, the Prime Minister was in Brussels for the NATO Summit. 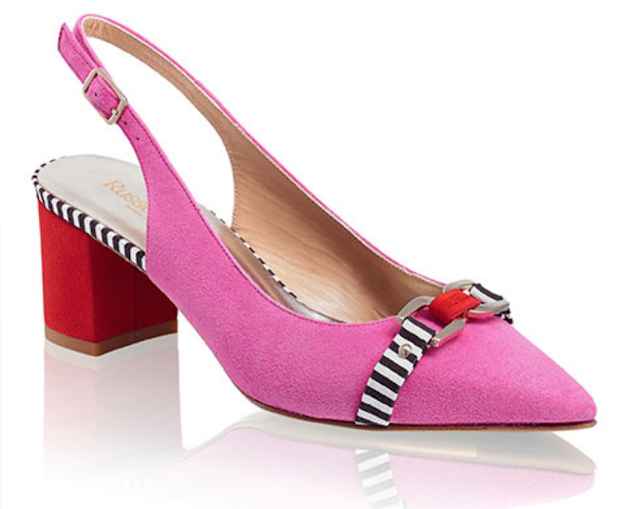 May wore her bright blue Daniel Blake Orchid skirt suit, a string of pearls and the black Twiggy kitten heels. 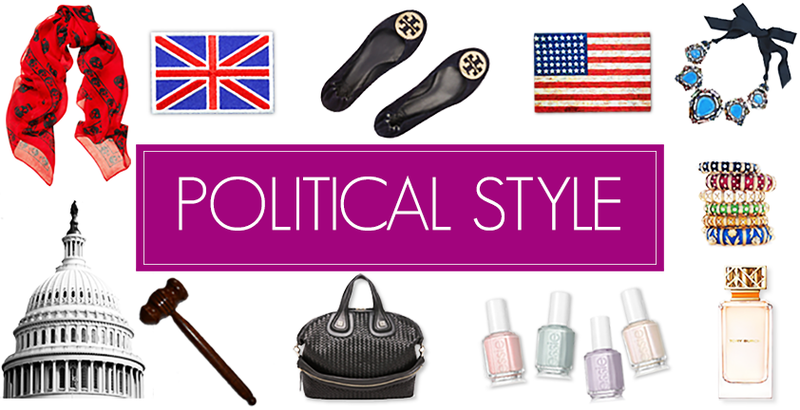 A powerful combination! And on Thursday, one of our favourite Peserico jackets was back in the mix. The navy and white number looked great paired with cropped navy trousers and the Audrey red suede kitten heels. 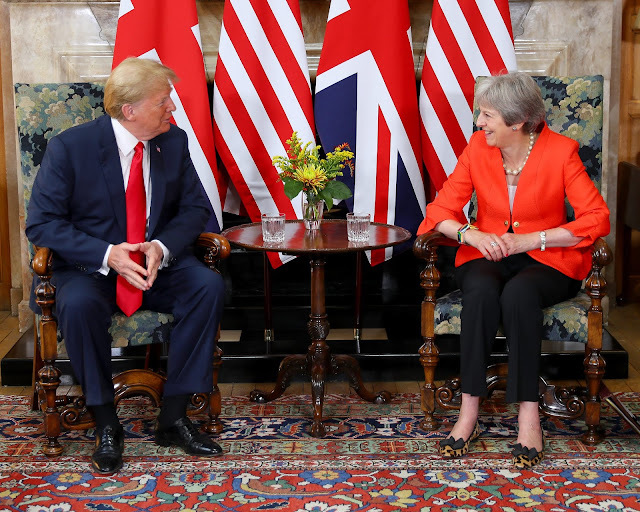 May also accessorised with her faithful oversized chain necklace and bracelet from Amanda Wakeley. 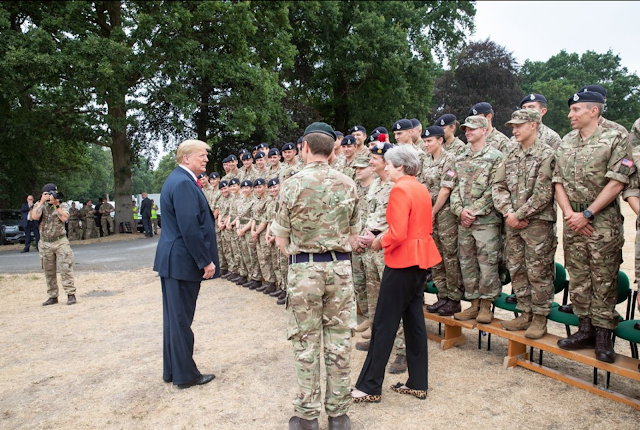 The PM returned to the UK ready to welcome President Trump and the First Lady to Blenheim Palace, Oxfordshire for the first day of their working visit. 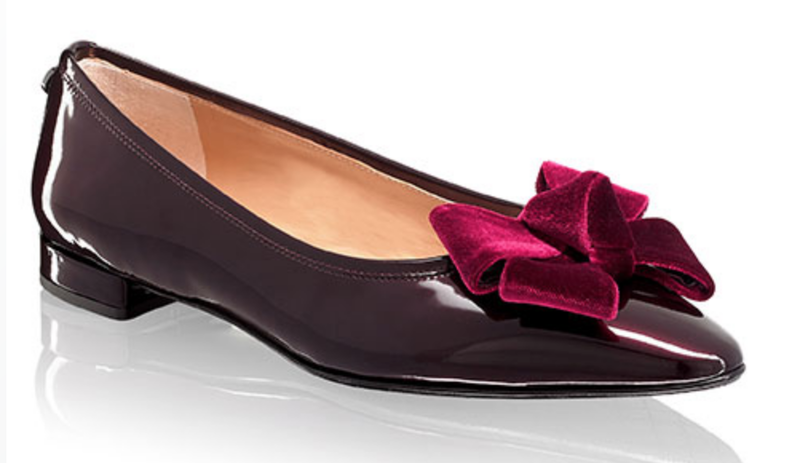 For the black tie dinner, May wore her red silk long gown (with a daring back slit,) and the red patent LK Bennett heels. 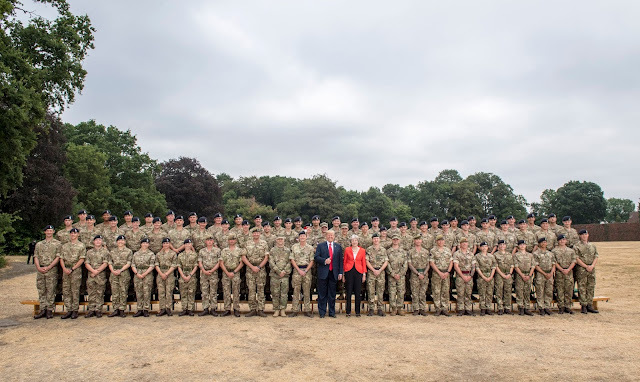 Friday saw Theresa May accompany Trump to Sandhurst before they headed to Chequers. May debuted an awesome new jacket from Daniel Blake- the Nerhu in bright satsuma. 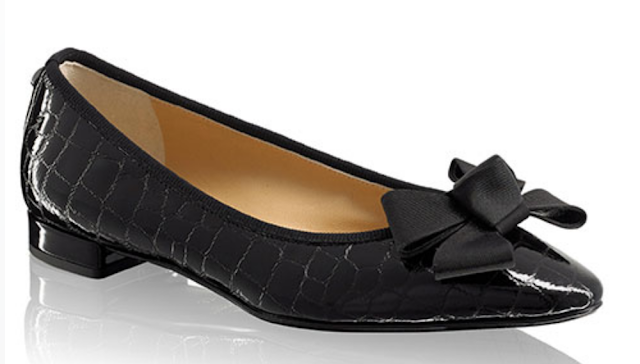 She teamed it with black trousers and the leopard Delicious flats from Russell & Bromley. We've had a few messages asking about the PM's great dress that she wore at the Conservatives summer event last week. 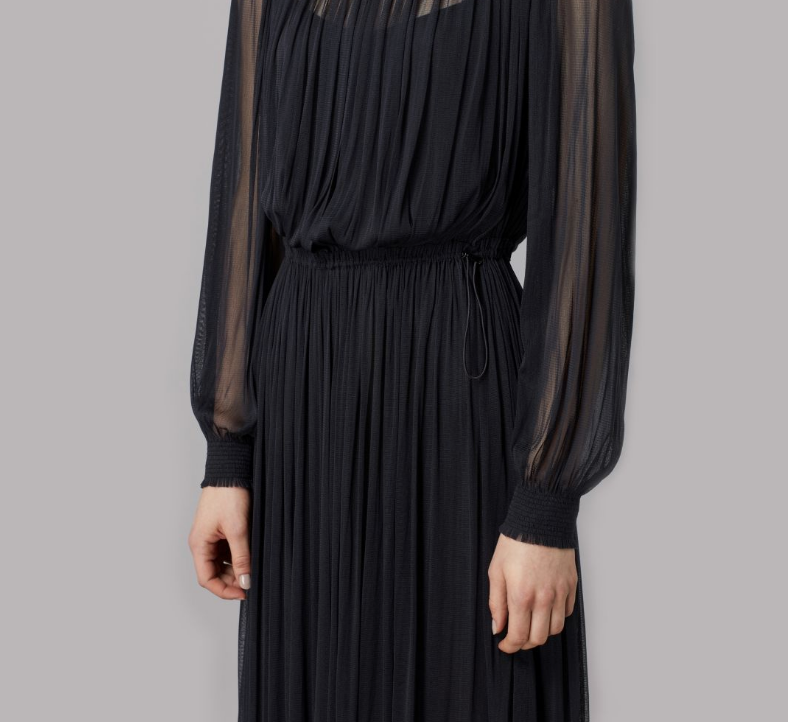 After some scouting, it is the charcoal tulle Marta midi dress by Amanda Wakeley! Made from layers of airy light tulle, the silk midi dress is the epitome of feminine elegance. Delicate, gathered detail through the dress gives this piece an ethereal and almost Grecian quality. Whilst we can't see which shoes Theresa May paired it with, she did accessorise with the rose gold and black grosgrain ribbon oversized chain bracelet and necklace, also from Amanda Wakeley. A fine choice! 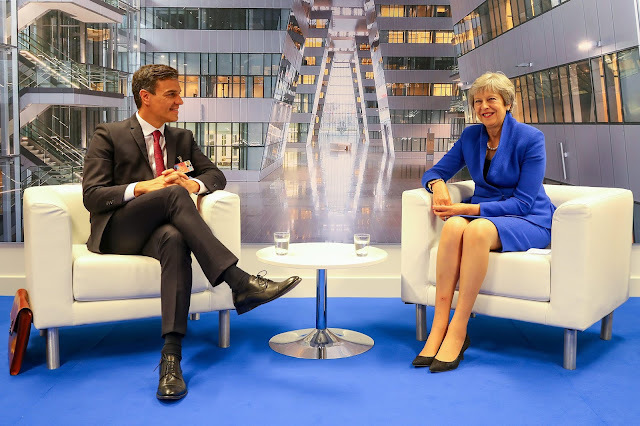 From Berlin to Brexit, here's a recap of Theresa May's week. 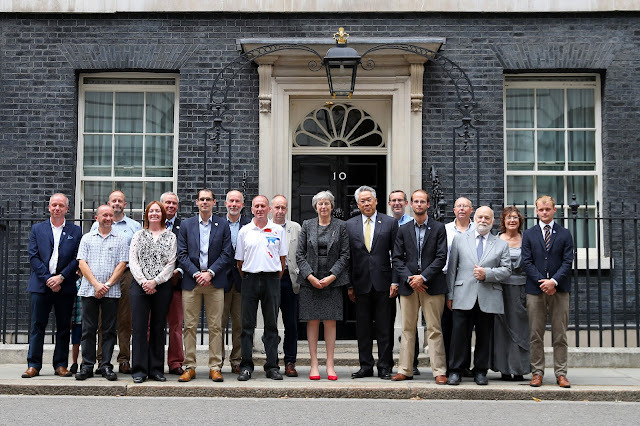 On Monday, the PM was in Number 10 before delivering a statement in the Commons chamber. 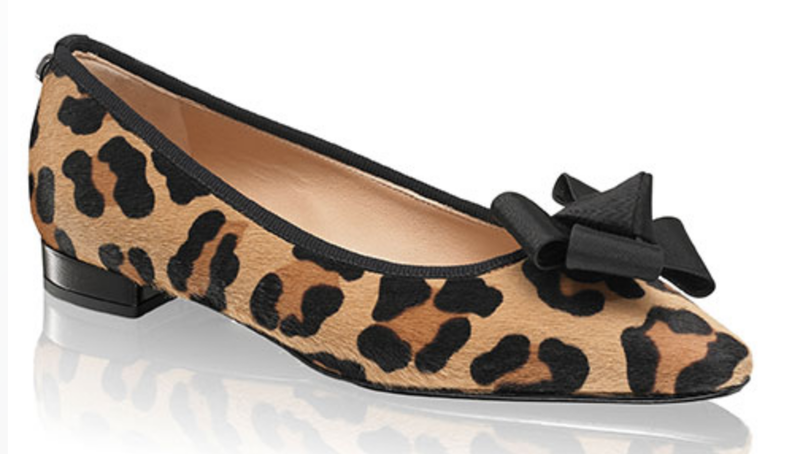 May wore her oatmeal Daniel Blake jacket with trousers and the leopard Delicious flats from Russell & Bromley. 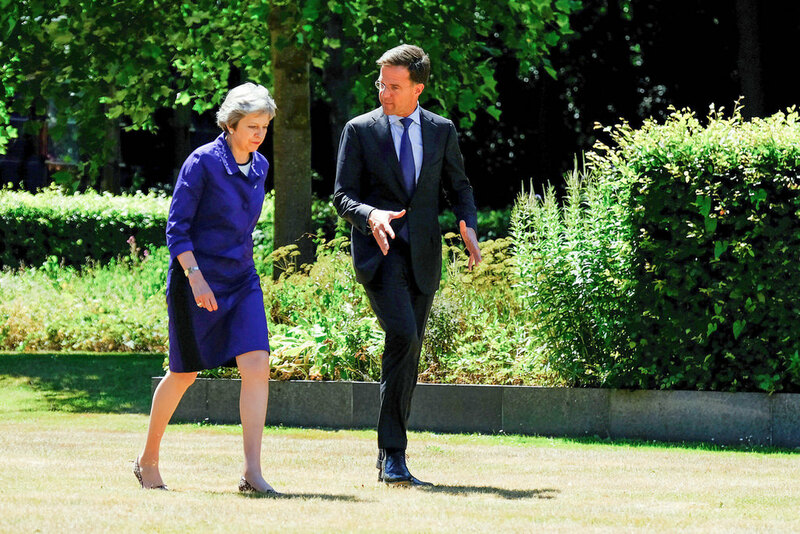 On Tuesday, May visited Prime Minister Rutte in The Hague. 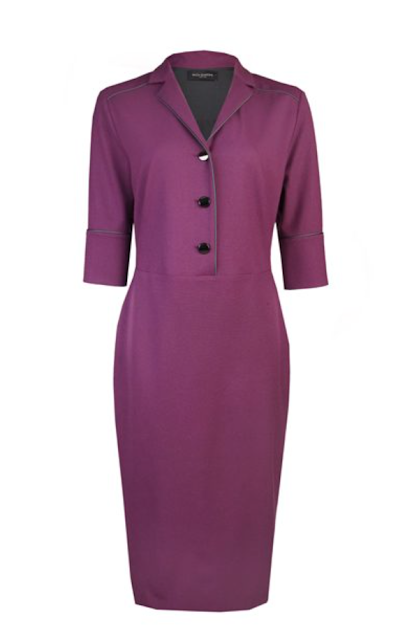 It was a return to the great violet Paule Ka jacket and dress for this trip! 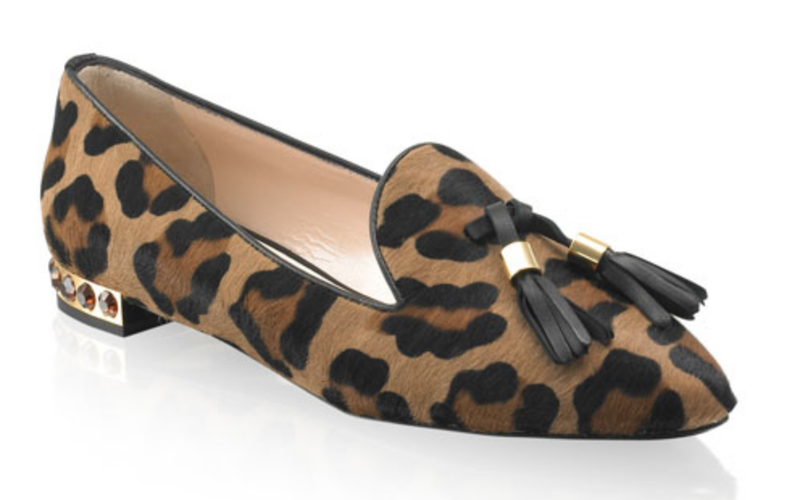 May teamed it with the leopard Kitty heels from Charlotte Olympia. Later in the day she held a Pride reception at Number 10. 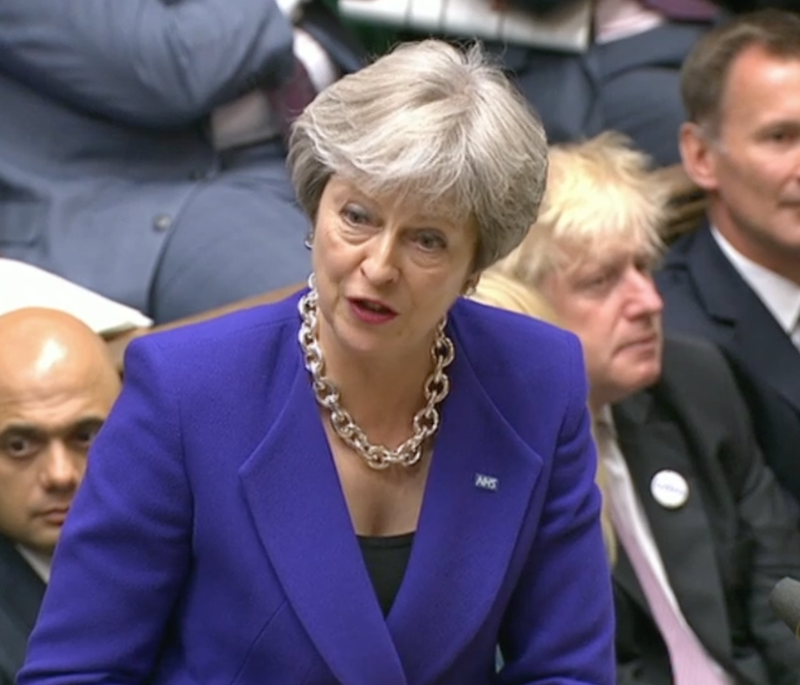 On Wednesday, May took part in the weekly Prime Minister's Questions session. She wore her fierce purple Daniel Blake Orchid jacket with matching skirt, teaming it with the oversized silver chain necklace and bracelet from Amanda Wakeley and the red and violet block Link In heels from Russell & Bromley. 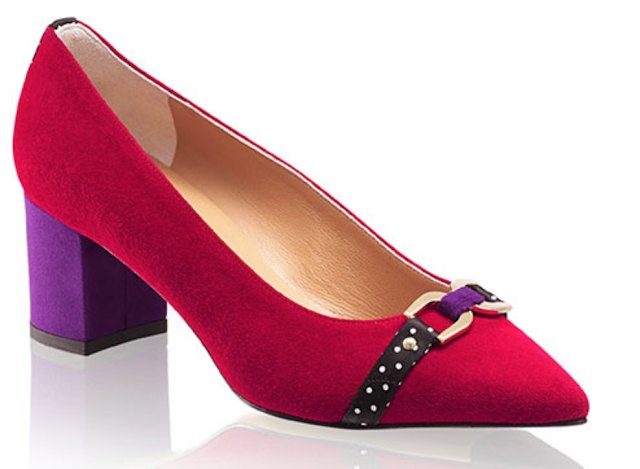 And be quick shoe fans as these are currently on sale! 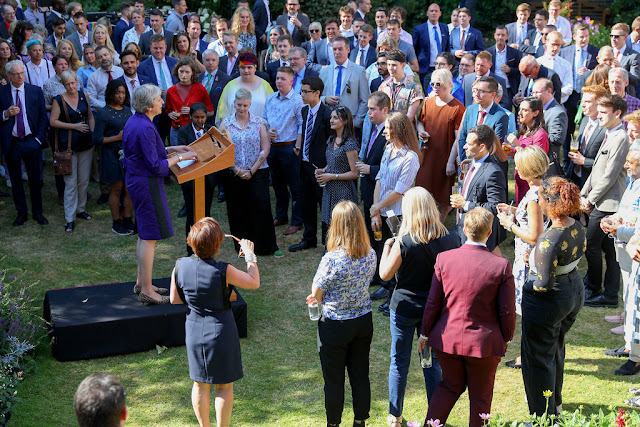 In the evening, the PM attended the Spectator summer party and held a reception to mark 70 years of the NHS at Number 10. On Thursday, May travelled to Berlin to meet with Chancellor Merkel. 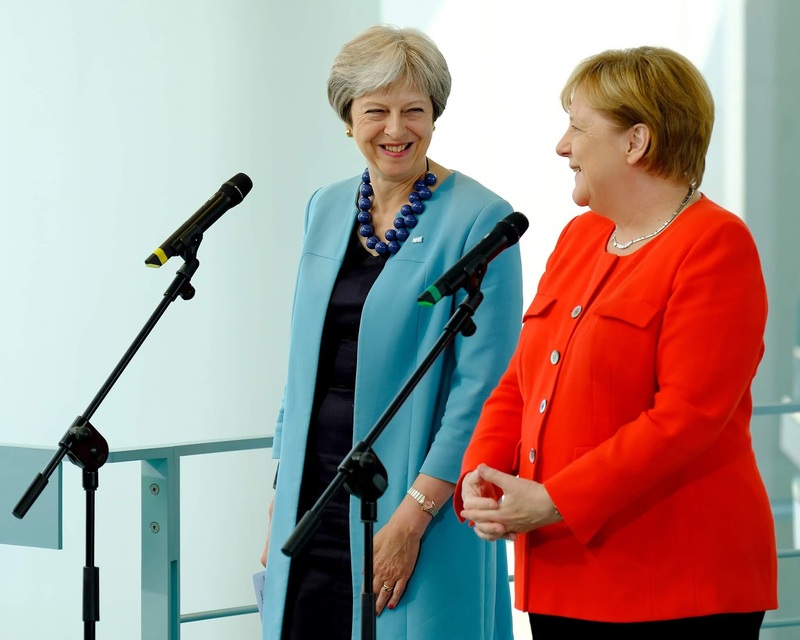 May wore her navy Amanda Wakeley shift dress, teaming it with her bright blue coat, the navy Mirta Bijoux Balls necklace and her new blue Rosehip kitten heels from Russell & Bromley. 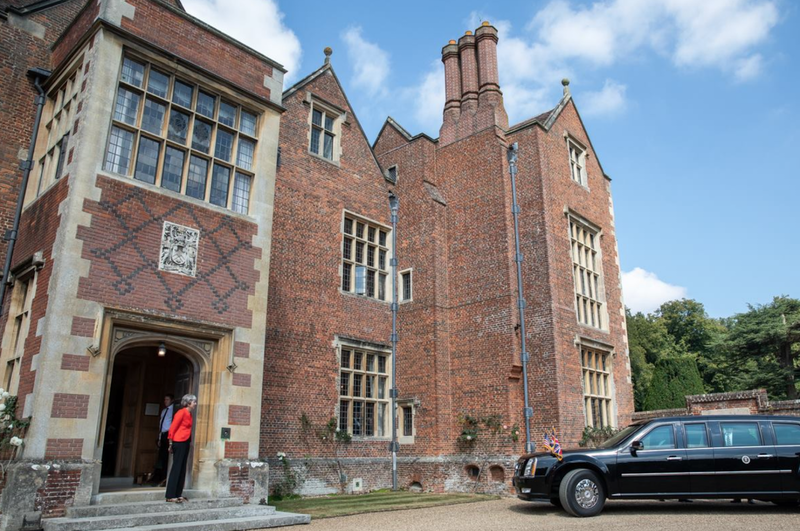 Embed from Getty Images On Friday, the PM and the Cabinet were at Chequers for Brexit discussions. May wore a new purple pencil dress with piping from Piazza Sempione.